It’s here. We have launched our first INEOS Team UK test boat, which we are calling T5. 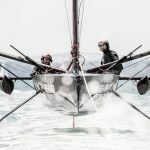 It’s an 8.5 metre foiling monohull based on the parameters of the AC75, and we first launched it in late June. The AC75 is the class of boat that will contest the 36th America’s Cup, a foiling monohull with twin lifting T-foils. It’s a very new concept and we felt that it was critical to our campaign to get on the water quickly with a boat of this type, albeit a small-scale version of the one we’ll race. 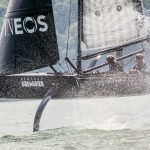 The rules for the 36th Cup only allow the teams to build two full-size raceboats and the first cannot be launched before 31 March 2019. The rule also forbids the building of surrogate or test boats over the length of 12 metres, so T5 has to comply with this length limit. We were informed about the concept of the AC75 late last year, but we didn’t see the full draft of the rule until the end of March, just three months before we launched. So we had to make some assumptions to get this boat on the water this early, but they have worked out fine and the boat accurately reflects the AC75 in all the important parameters at this scale. T5 began life as a Quant 28, but has been significantly modified to match the features of the AC75. We installed two foil arms and the T-foils, along with all the systems required to control them. We changed the rudder, the deck layout and the hardware, and put a different rig into the boat. There was a lot of work, but even though we had to go right back to the bare hull and start again, it was still quicker than building a new boat. Our speed has bought us time on the water this summer. We can learn a lot about how the boat performs, and we will be able to move quickly through iterations of the design. And given that there’s so much to learn about this new foiling monohull concept, it’s critical to sail and test ideas this soon in the campaign. We weren’t anxious to share any of this with the opposition teams in New Zealand, Italy or the US and we managed to keep it pretty quiet for a few weeks. But the Solent isn’t a particularly private place and inevitably the photos and videos started to appear online. The Kiwis were on the phone fishing for information about how the boat “really” sails. They have only sailed it in their simulator so far and were understandably keen to hear how the boat was for real. We told them it sailed just fine. This is the biggest advantage that launching early gives us: we have more time to verify what our computer modelling and simulations tell us about the boat. This in turn gives us more confidence in the design for our first raceboat, which will be launching after the rules deadline at the end of March next year.We know the other teams won’t be that far behind us and we must keep pushing harder than ever. We’ve a lot more work to do before we race in Auckland in 2021, but this is a great start and a real credit to the whole team.